My wife and I currently have 3 full-season tickets to the Nashville Predators for the 2010-2011 season, and are looking to split these tickets with one or more parties. With our oldest daughter starting kindergarten this year, and what seems like overwhelming time commitments in other areas, it is just not possible for us to attend 41 games any more per season. These seats are fantastic. They are in section 310, Row C, Center-Ice. We have been sitting here for 7+ seasons, and the fans in this section are really great. We are open to many different options for splitting these. If you want 5 games, 10 games, 1/2 a season, 1/4 of a season, whatever….we can work out the details. Price will be the same season ticket rate that we pay, which is less than the current face value. We locked in our pricing before last season. 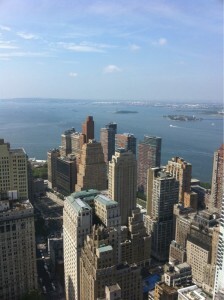 Beautiful but hot day in the Big Apple. I was fairly appalled by the ESPN program on Thursday evening called “The Decision,” a one-hour, prime-time special concocted by LeBron James to announce his Free Agency decision, and welcomed by the four-letter network with open arms. The following are my thoughts on this spectacle as it relates to both LeBron and ESPN. This self-centeredness is even further amplified by the revelation that his former team, the Cavaliers, found out about his decision during the telecast. This is shocking, even for a professional athlete. What is not shocking is the Cleveland fan’s outrage over the way the announcement came down, or LeBron’s lack of emotion regarding leaving his hometown team. (What is shocking is the “Open Letter” from the Cavaliers’ owner, but that is for another post on another day) If you listened to the interviews, you could tell it was ALL about him. How many times did he refer to himself in the third person or refer to HIS talents. More than any other professional league, The NBA is driven by it’s “Stars,” and it is this type of behavior that makes me want to turn the channel away from these personalities. I have no beef with the decision itself, but he handled it about as badly as possible. ESPN – While this is not a new trend, “The Decision” marks the final leap of ESPN from Sports NEWS to Sports ENTERTAINMENT. I guess this is appropriate since the “E” stands for “Entertainment. Instead of covering the story, ESPN sold it’s soul for the right to be part of the story. All day today, sports personalities from talk-show hosts, to former players, to coaches, etc. have been openly critical of the way LeBron and ESPN handled everything. However, turning over to ESPN TV or Radio, you come away with a completely different slant. Why? Because they were part of it. If they are critical of the event, then they have to be critical of themselves. This isn’t journalism. This isn’t covering the story. This is the story! What little, tiny shred of journalistic integrity remained at the four-letter network is now gone. Well, that’s my two-cents….what do you think? Back in April I wrote a post on my first impressions of the iPad on the day the 16gb version was released to the public. In that post I was fairly critical of a number of decisions that we’re made regarding it’s design and configuration, and questioned what niche the iPad was designed to fill. In the months since that initial post, I have since changed my mind regarding a number of those earlier criticisms (not all), and have even obtained an iPad of my own as a tool to use in teaching and public speaking. I have eaten my crow, and now would like to share my updated impressions as an iPad owner and user. Lightening Fast – This is the iPad’s killer feature. In my initial review I noted my disappointment that the iPad was running the same OS as the iPhone and not full blown OS X. However, now I realize this decision along with some pretty solid hardware specs has resulted in a device that is ridiculously fast. For years there has been talk of the “instant on” computer, and the iPad pretty well fits this description. Even though my netbook will allow me to do more related to content creation, it is also very slow comparatively speaking. With the impending release of iOS4 for the iPad, some of the OS limitations will be resolved, such as multitasking. Better than Expected Keyboard – my initial reaction to the on-screen keyboard was that it was usable, but would be a bit of a struggle. However, I’m finding it to be even more usable than I originally suspected. So much so that I’m actually writing this post using my iPad. In my first week of using the keyboard, I’ve become proficient enough to type with all fingers in landscape mode, and have even been able to take notes in business meetings. As I originally noted, typing in portrait mode is still painful. It is too wide to use your thumbs, and too narrow to use all fingers. Battery Life – as of right now, I have been using my iPad for about 3 hours, and my battery meter is still at 78%. This is way better than either of my netbooks, and miles better than any laptop I’ve ever owned. Honestly, it’s better than my iPhone as well. This makes the iPad great for travel and really long meetings (which are both common for me). Size – the size is perfect for carrying around or placing in your lap during a flight. True that it is heavier than the dedicated eReaders like the Kindle, but this device is so much more than just a reader. The screen is also large enough that it works well for web browsing, viewing e-mail, documents, pictures etc. Web Browsing – from the moment the iPad was introduced by Steve Jobs I have been very critical that Flash was not included. It is purported that up to 85% of mainstream web sites use Flash, and I saw it’s absence as a major hole in the potential Internet experience. However, after using the iPad for a while, I can honestly say that I barely miss it. Some of this is because I can see what an impact Flash can have on mobile performance (e.g. Flash on Android), but mostly this has to do with many mainstream sites offering iPad optimized versions of their sites, or even separate apps for viewing web content (e.g. Netflix and ABC.com). I will occasionally run across a video that I cannot watch without Flash, but this has been the exception, not the rule. Email – as I noted in my initial impressions, the email app on the iPad is hindered by the lack of a universal inbox and the 4 taps required to switch between mailboxes. However, this will be resolved once iOS4 is released for the iPad. Otherwise, the mail app on the iPad is fantastic, especially in landscape view. I find it to be a better experience than using my laptop or desktop. Books – the iBook application and store are really elegantly designed, and the iPad is a fantastic device for illustrated children’s books, or any other illustrated text. Reading on the iPad in a non-glare environment is really very pleasant, but reading under direct light or in sunlight is next to impossible. I you simply want a reading device, nothing compares to the Kindle or Nook, but the iPad is about so much more than just eBooks. The iBook application is what I use to store and view all of my PDF notes for teaching classes and preaching sermons. It really is an excellent PDF viewer, and the interface makes it easy to organize your files. As a side note, the Kindle app for the iPad is quite beautiful, and since my wife has a Kindle, I will mostly likely us this app should I choose to purchase a standard novel, biography, etc. As an alternative, I highly recommend Documents to Go (14.99 from Dataviz) which allows access to an array of cloud based services, and allows you to work natively with MS Office file formats. Apps – I plan to write some additional posts reviewing some of the apps that I find most useful for iPad. In general, I don’t understand why Apple failed to include some of the base apps that are in the iPhone such as Clock, Weather, Calculator, etc. As I noted before, existing iPhone apps that have not been ported to the iPad look really bad. Native iPad apps such as Pulse, ABC Player, and Bloomberg are very elegant, but it will be a while before the selection of native iPad apps is in the same league as the iPhone. All in all the iPad is a killer media and data consumption device and is better at content creation than my initial observations. It is a much better business tool than I could have conceived. Tomorrow I have a 2 hour meeting with a very important client in NYC. Do I put the iPad to the ultimate business test and leave my laptop behind? Time to see how proficient I can be at taking notes on the iPad. What are your thoughts on the iPad? Gulf Oil Spill – I am wondering when the Michael Moore film will be coming out chronicling the mishandling of the gulf oil spill by the Obama administration?? Not holding my breath. How in the world can we LAMBAST GW over his handling of 911 & Katrina, but barely say a peep about Obama’s reaction to the oil spill. What exactly has he or his administration done to help the situation other than make crude, public statements disparaging BP? Wasn’t he supposed to be the president that would be committed to protecting the environment? Gulf Oil Spill (Part 2) – This should not be a problem that is placed solely on the shoulders of BP. Why does it matter at this point who is to blame? This event is going to effect so much that we should be exhausting every available resource to stop the leak, and clean up the mess, instead of simply making antagonistic statements towards BP. And for this notion of boycotting BP gas stations??? That’s a GREAT idea. Let’s further financially cripple BP so that they won’t have the resources to continue working on the problem or the cleanup. What about offering a One Billion Dollar reward to the first company / individual / etc. that can successfully stop the leak. Wouldn’t that be worth it? I mean, how many BILLIONS in economic impact is this spill going to cause? From the fishing industry to tourism to cleanup cost to ??? Instead, our current administration seems to be content to sit back in Washington and yell at BP, while the oil slowly destroys the gulf, and the Louisiana, Mississippi & Florida coastlines. We need a leader right now, and not a politician. Arizona Immigration Law – I just don’t understand the uproar. To quote one of my favorite movie lines…”I feel like I’m taking crazy pills!” Our country is in an uproar because Arizona is saying that they have the authority to enforce the LAW? To enforce that aliens are required to have the proper paperwork? Haven’t we been complaining about the problem of illegal immigration for years? I don’t get it? When I go to Honduras, I get stopped by the authorities almost once per day. If I can’t produce a valid US Passport, then they would take me immediately to jail until the proper paperwork could be produced. My understanding is that this is very similar to other countries in Central America, including Mexico. Nashville Flood Telethon Donations – Has any of this money actually reached the people who need it? I hear about all kinds of organizations providing bottled water, and what they describe as “basic necessities,” but what people really need is drywall, carpet, bathtubs, etc. Will any of this donated money actually go toward meeting these needs? Our local media has done a very poor job of providing information on exactly where this money is going. College Football / Basketball – From the USC violations & sanctions to the impending conference shakeups, it seems as though College Athletics is in disarray. College presidents are famous for always talking about how a football playoff system would negatively impact academics, but this is clearly a hypocritical stance. This impending shakeup is ALL about money, and so is the bowl system. I’m not necessarily a proponent of a playoff system over the bowl system, but I am a proponent of college football and basketball. I’m nervous about how this formation of 3 SUPER conferences (SEC, Pac-10, Big-10), and the elimination of the Big 12 will affect College Athletics, and particularly the schools that are not in these conferences. Stephen Hawking – Earlier this week, the famous scientist Stephen Hawking was quoted as saying that he was confident science would eventually disprove the existence of God. Interesting position coming from a man whose science can’t even explain the origins of the matter that (supposedly) randomly and accidentally resulted in the formation of the solar system, the earth, and human life. I wonder who actually has more “faith?” Me in my God, or him in his science? 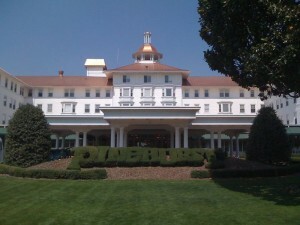 We have arrived at Pinehurst! While I am a huge Apple fan (my family owns 5 Macs, 2 iPhones, & 5+ iPods), I have been openly critical of the iPad since it’s introduction by Steve Jobs. My criticisms have included the lack of Flash support, the inability to run multiple apps simultaneously, using the iPhone OS instead of full OS X, and lastly my failure to understand the niche it is designed to fill. Well, today I got my first opportunity to spend some hands-on time with the 16gb iPad, and thought I might share some of my impressions. *At 8pm the Apple store in Nashville still had plenty available with no line. Not sure what to read of this. Could be lack of demand or could be that Apple was better prepared for the volume than with the iPhone. Only time will tell. *The device is slightly smaller than I pictured in my head and incredibly elegant. Feels extremely sturdy. No surprises here. Apple gets design in a way that no other computer/device company does. *Native iPhone apps that have not been updated for the iPad look ridiculous, especially in 2x mode. *The keyboard is awkward, but usable. No way to thumb type in portrait mode, so the user will be forced to use one finger or set it down on something. Using the keyboard with all fingers in portrait mode is difficult. *iBooks are pretty slick, but I worry about the glare. Do not like the two-page view in landscape mode. Very nice that you can also read Kindle and Nook titles that are not available from the iBookstore through downloadable apps. *The mail application is great for displaying and reading messages but suffers from the same problems as it’s iPhone sibling when using multiple mail accounts. From what I can tell there is no universal inbox and switching mail accounts takes multiple taps. *The screen is beautiful for viewing photos and videos. Really is a great media viewing device. *The iPhone OS does not translate well to a slate form factor. Really amplifies the need for some type of dashboard. Flipping through twelve screens to get to an app seems very cumbersome. *The new, touch-enabled iWork apps are not intuitive at all. Very frustrating to try to do what should be the simplest tasks. Really amplifies the fact that this device is for “consuming” media/data and not “creating” it. Also, with Microsoft announcing this week that they have no plans to bring MS Office to the iPad, it is really hard to see this as a business tool. *Games look really great. Was only able to watch someone else play them, so I can’t provide feedback on playability. However, I can see this being a great gaming device. Well, that’s my 2 cents after my first use. If you are looking for something small and elegant that can be used for web, email, photos, books, videos, & games, then the iPad is definitely worth a look. However, if you are looking for an extremely portable device that can be used for business travel, then I would recommend looking elsewhere for now. I’m still not convinced there is a solid, long-term niche for this product, but I hope I’m wrong. The thing I’m most interest in watching is the app development. For example, will there be EMR/EHR apps written for the iPad for clinical environments? Will there be usable Office Productivity apps that will make this viable for business travelers? I’m also interested in hearing about how the screen glare affects those who read a lot of titles on the iPad. I’m sure I’ll have more thoughts as I get further exposure to the iPad, but that’s all for now. If you have an iPad, I would love to hear your impressions (strengths & weaknesses). Good night! I don’t know how much longer Patric Hornqvist is under contract, but the Preds need to make sure he stays with the organization for a very long time. He always seems to be the hardest working player on the ice. Most of his 30+ goals this season have been down and dirty in front of the net. I don’t understand all of the “fans” that do nothing but criticize the team, the coaches, the management, etc. even when the Preds are doing really well. If you hate the team so much, why do you come to the games? I hear this constantly at the arena. We are lucky to have one of the best coaches and GMs in this league. The system that Trotz uses is not always the most fun to watch, but it gets the most possible out of a team built with limited funds. To piggy-back on the previous thought, why is David Legwand such a reviled player? I realize that he has never had the offensive production you would expect from a #2 overall draft pick, but he has been the Preds most consistent two-way player for a very long time. His line is always matched up against the opponent’s #1 line, and he consistently does a good job of shutting them down. I would also argue that he is our best and most consistent penalty killer. I for one am glad that he is a Nashville Predator. I don’t understand what Wade Belak brings to our team. Maybe someone can explain it to me. Dustin Boyd was a great pickup by Poile at the deadline. Really enjoy watching him play. I hope we can bring Dan Ellis back next year, though I realize this is highly unlikely. I’m looking forward to the playoffs, and hoping we can avoid San Jose or Detroit.